The new designed interface of Caligraph software has been fully optimized to offer a better experience to the users and administrators. With a clear and well organized interface which facilitates reading and usability of the software for faster and efficient daily use. Thanks to its new architecture, browsing between menus, screen and different selections has been limited to its minimum and streamline its use. Nevertheless Caligraph remains available to use with Microsoft Windows tablets and Touch screen thanks to its integrated virtual keyboard. While extremely easy to set thanks to the exclusive use of a dialogue window and configuration wizards, Caligraph is able to set the most demanding sequenced test protocol. No need to use lines of codes or to know a specific language, each setting or calculation is done through the graphic interfaces. Caligraph comes with an extensive list of pre-defined calculations, which can be performed automatically during your tensile, compression or torsion test – It includes standard calculation such as maximum, minimum, average, or break; as well as more sophisticated calculation as Young’s modulus, modulus of elasticity, slope calculation by the method of least squares etc. 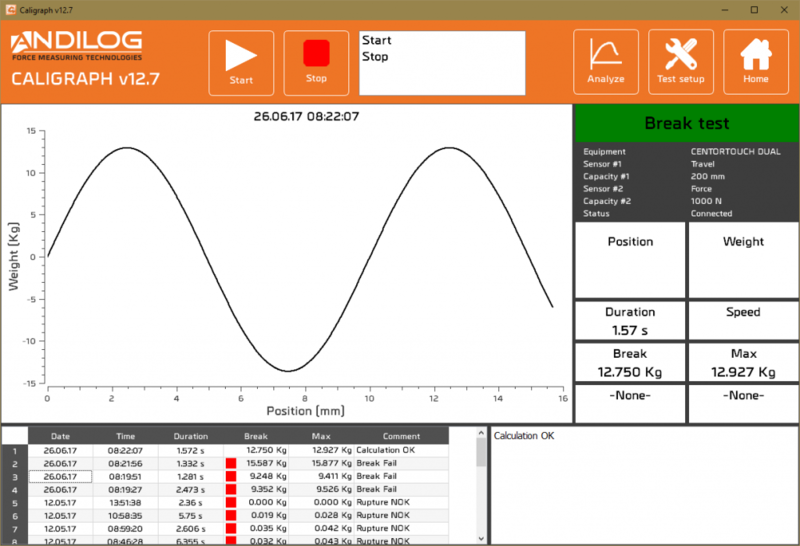 The acquisition software Caligraph enables you to determine the starting conditions of the test (force or torque detection, click etc.) and to tare the sensor before the data acquisition. 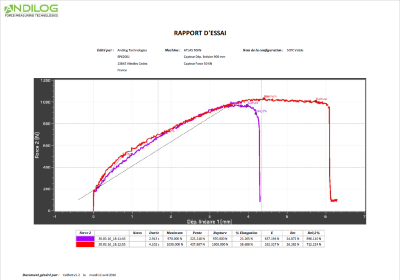 You follow in real time the plotted curve, visualize up to 4 pre-registered calculations and define the saving of your results on demand or automatically in order to ensure an optimal follow-up of your tests. 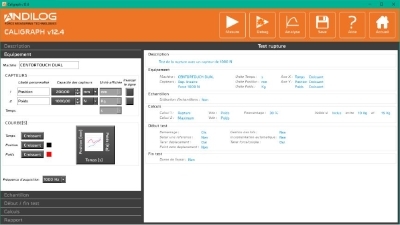 Caligraph has an advanced report wizard feature to adapt the edition format to each industrial application. You can export measurement results in Excel or customize a report in WORD or PDF format. Each report can be formatted to include the required data: curve, table of results, logo, test configuration used…it can be edit for one or to compare several test results on the same report. An editor allows users to modify the header or footer of each report for a total customization. 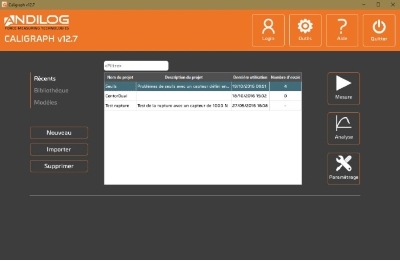 These report can be automatically generated at the end of the measurement, and then ensure an perfect traceability of measurements. 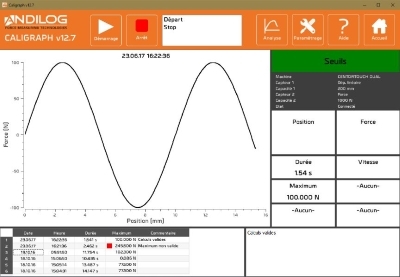 Andilog´s software are constantly evolving, whether to add new features, new tools, improve performance or use. The updates of Caligraph can be downloaded, if the computer is connected to the internet. You don’t need a support contract or pay for updates. Enjoy our telephone support without maintenance contract. 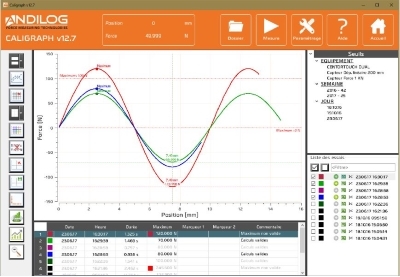 The Andilog team is here to assist you to achieve your present and future measures and use the best performance of our instruments and software.